It was just getting light when I headed out the door this morning. It was moving day once more. 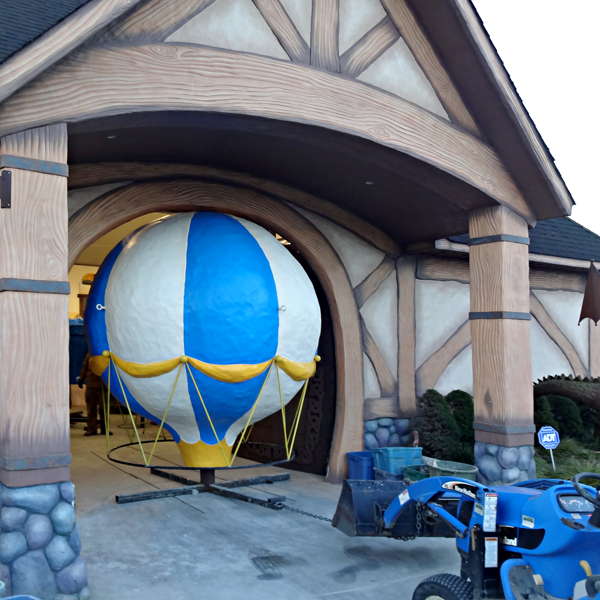 The mountain top, giant tree, and the balloon were to be loaded onto the trailers and taken up to the lake. The mountain top was first to be loaded. It weighed in at a heafty 4,500 lbs and was plopped on Chris' trailer. He blasted off to the lake to unload and then turned around for a second load. I never got any pictures as I was busy squeezing the balloon out of the shop. Squeeze was the operative word as it was a very tight fit. We managed to get it out with only a few scratches on the balloon. The tree was next to be loaded onto my trailer. It only took a few minutes to hook up the rigging and then it was time to make the tree fly! I then made a beeline for the lake while Chris returned for the balloon. I got back just as the balloon made it maiden flight. All three pieces arrived at the lake site in perfect shape and were unloaded by Chris' crew.